Tropical wedding reception themes don't have to cost a fortune, which helps when you are planning a cheap wedding reception! This is not about you paying for all your guests to go to Hawaii, this is about you bringing the tropics indoors or to your own backyard! There are lots of ways to add tropical touches to your wedding from your invitations, your flowers, your dress and your decorations. But you don't have to theme everything, subtle touches work just as well as a big explosion of color! One of the first ways that your guests are going to know the theme of your wedding is when they receive their invitation. Subtle tropical themes could be designs with a shell, a starfish, or a palm tree. For an invitation with lots of color go with the beauty of tropical flowers, or have an invitation in the colors that you want to use. Tropical colors could be yellows and oranges of the sun, the turquoise blue of the sea and the pinks, reds and oranges of the flowers. Anthuriums, Birds of Paradise and Orchids are a few of the tropical flowers that are available all over the world and throughout the year. So even if you were planning on having your tropical wedding over the Christmas period you would still be able to get hold of them. The problem is tropical wedding flowers are not cheap flowers, however thanks to their amazing colors and their stunning good looks you don't need many! Infact you could probably just have one big tropical flower in your bouquet or your centerpiece and then bulk it up with tropical foliage (big leaves) or fill with complimenting flowers. Let the tropical flower take centerstage. Your tropical wedding reception needs to also be as colorful. When you think about a tropical destination you will think about the vibrant colors, the sunshine and the relaxed fun atmosphere. It is all about creating the right mood. You want a Hawaiian Luau or feast without the expense! If you are having an outdoor wedding then use and enhance the plants that are already available, add colorful lanterns and torches and add extra splashes of color with bright flowers. 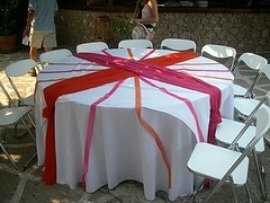 For indoor tropical wedding reception themes see if you can hire mini palm trees, have very bright colored tablecloths; pinks reds, oranges and yellows and then add flowers or candles. To keep your flower costs down, call in lots of help from family and friends. You can buy flowers direct from the wholesalers online and look to add fruit to your displays to add an extra tropical twist, plus it bulks up your displays quite cheaply. Tropical foliage is also a way to add to your flowers without adding extra costs, if you think about the flower arrangements that you see when you are in the tropics they have lots of leaves mixed in too. If you are looking for more subtle tropical wedding reception themes then add splashes of the bright colors to your room's decor. Coral and turqoise blue is stunning and white with splashes of color is more subtle. 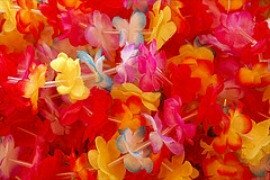 If you have enough left over in your budget buy your guests silk leis, these are the flower garlands that your guests will be greeted with and wear for your wedding. These can also be your guests' favors. You can buy these quite cheaply from most party shops and they add an extra touch of fun. Other tropical favors could be mini sandals, chocolate shells, a message in a bottle saying thank you or even a bucket and spade which is a great one if their is a beach nearby and lots of children.